We are lucky enough to have a sizeable vegetable patch adjacent to our flower garden, a space which is primarily tended to by Daniel's stepdad. 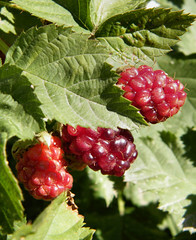 All manner of green, leafy things grow there under Tomás' care, including a sprawling, prickly blackberry bush. The other day I noticed that the blackberry bramble looked rather heavy with fruit, so I carefully picked my way over to the bush through rows of burgeoning tomatoes and peppers. I (mostly) managed to avoid the thorny stems as I poked around for the juiciest, ripest berries, all the while reminiscing of the many times I'd picked wild blackberries from bushes in the woods back in Pennsylvania. 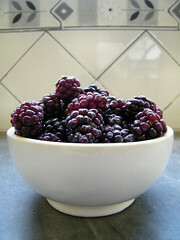 With my hands tinged ruby red by the blackberry juice, I returned to the house with my prize: a bowl filled to the brim with sweet-tart berries. 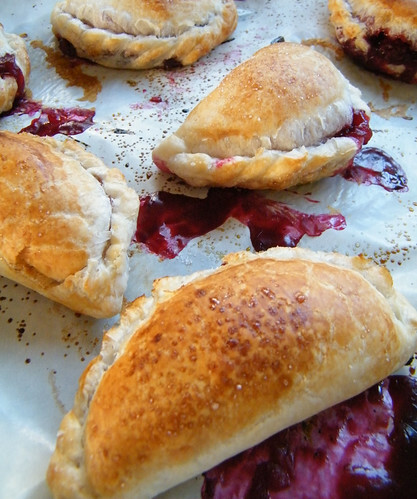 Though Argentines adore their empanadas, they rarely depart from savory recipes; however, I'd been itching to experiment with some dessert-type empanadas for a while. 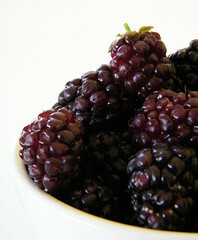 I decided that a sweet empanada would be a simple and tasty way to use this first bunch of blackberries. I love it when I'm right. Preheat the oven to 400° F, and line two baking sheets with parchment paper. Cook the blackberries, apple, flour, cinnamon and 6 tablespoons of sugar in a heavy saucepan over medium heat, stirring often, until the mixture just boils and is thickened, about 5 minutes. Take care not to break up the berries too much while stirring. Transfer to a shallow bowl to cool. 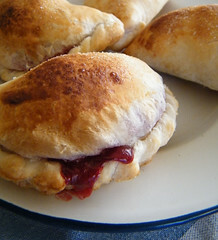 Place a heaping tablespoon of fruit filling in the center of the empanada disc. Moisten the edges of the dough with milk and fold in half, pressing the edges to seal. 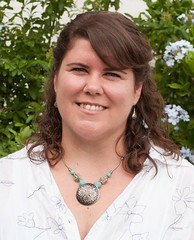 Transfer to a lined baking sheet and press the tines of a fork around the edges or make a decorative repulgue [video]. Arrange the empanadas 1 inch apart on the baking sheet. Repeat the process with the remaining discs and filling. 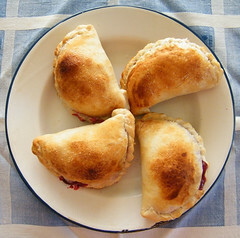 Brush the empanadas with milk and sprinkle them with the remaining 2 tablespoons of sugar. Bake until empanadas are golden, approximately 15 minutes. Remove them from the baking sheets to cool.